There’s no denying the importance of making an outstanding online impression. 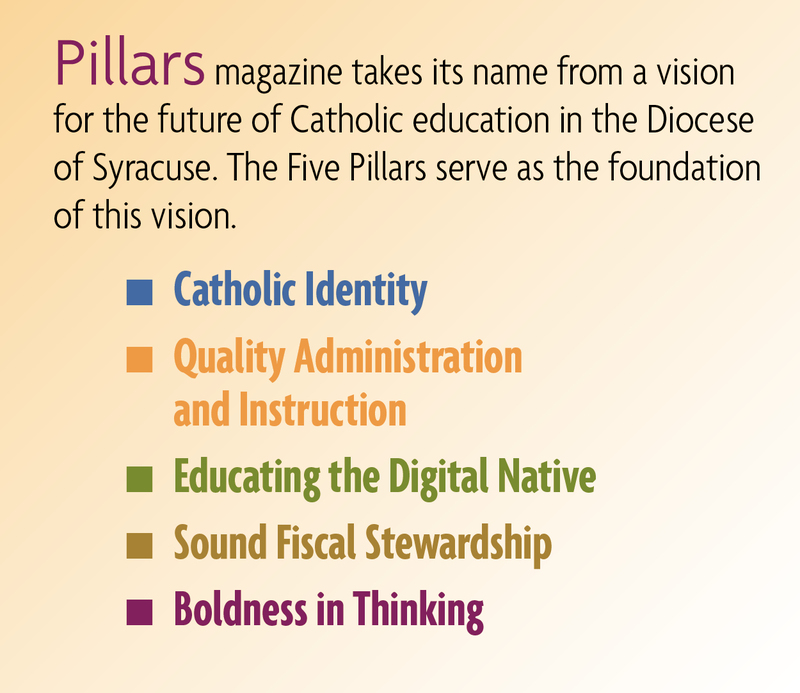 In an effort to jumpstart the 2015-16 school year in the Diocese of Syracuse, the Diocesan Communications Office began working with the Catholic Schools Office (CSO) over the summer months to formulate a communication plan that emphasized the importance of online branding, marketing, and social media. The conversation began at a CSO staff meeting, where Superintendent William Crist and staff spoke to Danielle Cummings, chancellor and director of communications, and Nicole Chenet, communications and social media specialist, about ways that the CSO can empower and support its system of 22 schools to enhance their online presence. On August 20, 2015, Cummings and Chenet spoke to administrators from each diocesan school at the annual kick-off meeting at Le Moyne College. The conversation included the importance of taking advantage of Syracuse Catholic Television, The Catholic Sun newspaper and diocesan social media to promote the good things that the schools are doing throughout the year. Cummings, who introduced herself as the Catholic school’s “biggest cheerleader,” encouraged administrators to contact the communications office anytime to promote events or simply seek marketing advice. At the same meeting, Chenet introduced administrators to the new diocesan employee portal, where staff could find important documents, calendars and more useful information, as well as the brand new diocesan media kit. The kit—which Chenet hopes will become an indispensable tool for the schools—contains a variety of information, including tips and tricks for writing a press release, a media distribution list by region, release forms, social media and website guidelines and best practices, and general marketing suggestions. Finally, administrators were introduced to a new diocesan offering called MySyrDio E-resources, a monthly, online resource that includes suggestions for social media postings, family and school activities, and more—all based on a monthly theme that ties together the United States Conference of Catholic Bishops’ catechetical theme for the year and the upcoming Jubilee Year of Mercy. Administrators were also reminded of the importance of using their Web sites and social media to not only engage current families but to also market their school to families who may be considering Catholic school. Many schools, like St. Margaret’s in Mattydale, Rome Catholic and the Catholic Schools of Broome County, have robust social media accounts; other schools are just beginning to establish an online presence. The goal, according to the communications team, is to meet the schools where they are and give them the tools and encouragement necessary to keep the process going. And the collaboration didn’t stop there. On October 1, the communications team met again with school administrators—this time to make a plan for Catholic Schools Week 2016. Although the annual celebration of Catholic schools isn’t until the last week in January, administrators have already agreed to a diocesan-wide day of service and a renewed commitment to not only showcasing the fun things that schools do during the week (like pajama day) but also the many faith-focused activities that are offered.